Nier[a] is an action role-playing video game developed by Cavia and published by Square Enix for the PlayStation 3 and Xbox 360. 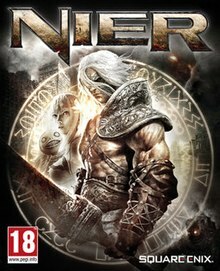 In Japan, the game was released as Nier Gestalt[b] for the Xbox 360, while an alternate version entitled Nier Replicant[c] was released for PlayStation 3 with a younger main character. A version that combined elements from both releases was in development for PlayStation Vita, but was cancelled in March 2011 due to Dragon Quest X taking precedence. The game is a spin-off from the Drakengard series, and follows the fifth ending of the first game, the events of which have left the planet Earth in a state of decay. Set over one thousand years after this, the game puts the player in control of the titular protagonist Nier, as he attempts to find a cure for an illness, known as the Black Scrawl, to which his daughter Yonah has succumbed. Partnering with a talking book known as Grimoire Weiss, he journeys with two other characters, Kainé and Emil, as he attempts to find a remedy and understand the nature of the creatures known as Shades that stalk the world. The gameplay borrows elements from various video game genres, occasionally switching between them and the main role-playing-based gameplay. The game was developed to appeal both to older players and to players outside Japan, where the developer was based. The music was composed by Keiichi Okabe, head of Monaca, a music composition studio, and has sparked the release of several albums. Nier was released to mixed reception; reviewers praised the story, characters and soundtrack and were mixed in their opinions of how well the disparate gameplay elements were connected. The execution of some gameplay elements was criticized, notably the side quests, and especially the graphics (which were regarded as substandard). Despite this, the game acquired acclaim among players over time, becoming a cult classic. A more successful sequel developed by PlatinumGames, titled Nier: Automata, was released in 2017 for PlayStation 4, Microsoft Windows and in 2018 for Xbox One. 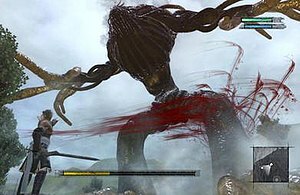 A screenshot from the game, showing Nier in combat with a boss monster. A bar representing the Shade's health is at the bottom alongside a map of the surroundings to the bottom right, and bars representing Nier's health and magic energy are on the top right. Players take control of Nier—a middle-aged man in Nier and Nier Gestalt and a teenaged boy in Nier Replicant—though the character can be renamed by the player. The player directly controls Nier through a third-person perspective to interact with people, objects, and enemies throughout the game. The player can also turn the camera around the characters, which allows for a 360° view of the surroundings. The three-dimensional world is divided into areas separated by loading screens, and the player can move freely throughout these areas by walking, running, jumping, and climbing ladders. In some rooms and buildings, the camera swings to the side and Nier is restricted to moving as in a two-dimensional platforming environment, while during certain battles the camera pulls up to simulate a top-down shoot 'em up or other video game genres. While traveling the player is frequently attacked by monsters, which include shadowy figures called Shades, large animals, and robots. Defeating these enemies gives the player experience points that can increase Nier's power, and money that can be used to purchase items. Nier can attack these creatures with either a one- or two-handed sword, or a spear. These weapons can be customized to have greater damage and abilities using materials that can be purchased, dropped from monsters, or scavenged around the world. Multiple different varieties of each weapon type can be acquired. The player can also use magic spells, which require enough energy from a constantly regenerating amount to cast. These spells include projectiles and large shadowy fists, among others; new spells are acquired in the first half of the game by completing specific battles. In addition to the main plotline, Nier includes numerous side-quests, which give the player experience points and money, as well as fishing and farming segments. The game opens with a prologue during the summer of 2049 in a snowstorm. In a modern, broken-down grocery store, Nier fends off attacks from ethereal monsters to protect his sick young daughter, Yonah. After defeating the monsters, he checks on Yonah, who has begun to cough badly. The game then cuts to 1,312 years later, where Nier and Yonah are now living in a village built upon the ruins of an old town. The low-technology village is one of several, and is surrounded by more modern ruins such as the remnants of train tracks and industrial machinery. The areas between towns are filled with monsters known as Shades that attack travelers. As Yonah's illness, the Black Scrawl, is terminal, Nier sets out to look for a cure. As he does, Nier finds a talking book, Grimoire Weiss, which suggests that the two team up to use Weiss' magic and to find a cure for Yonah's disease. In their search, they encounter Kainé, a hot-tempered and foul-mouthed swordswoman; and Emil, a blindfolded boy whose eyes petrify anyone they see. After journeying for a time, the village is attacked by a giant shade; the battle culminates in Yonah being carried away by a master Shade that suddenly appears—the Shadowlord—who carries his own book, Grimoire Noir. The game then jumps five years forward. Nier and the others are trying to find the parts to a key that they believe will help them locate the Shadowlord and Grimoire Noir. After defeating five Shades and assembling the key, the team go to defeat the Shadowlord. There, Devola and Popola, characters who have been guiding Nier on his quest, appear to try to stop them. They explain that over 1300 years prior, humanity faced extinction due to an incurable disease. In an attempt to survive, they separated their souls from their bodies using Grimoire Noir and Weiss. They created clones resistant to the disease, Replicants, and intended to recombine the souls, or Gestalts, with the Replicant bodies once it had died out; Devola and Popola were androids set to oversee the project. Over time, the Replicants had begun to form their own identities; while the Gestalts, or Shades, had grown aggressive to them. Nier defeats the pair, with Emil sacrificing himself to ensure his friends' progress. The remaining group then defeats the Shadowlord. It is revealed that the Shadowlord's true identity is the Gestalt form of the Nier from the prologue; the Nier the player has been controlling for the majority of the game is his Replicant. Driven to protect his Yonah, he was the first Gestalt and has combined her with the Replicant Yonah. The original Yonah, however, tells the Gestalt Nier that she can hear the new Yonah inside her, and that she loves the Replicant Nier and deserves the body just as much. She vacates the body, and Nier and Yonah are reunited. If the player plays the game again, they start just after the five-year skip. They learn about Kainé's past, including that she is intersex, which along with the death of her parents resulted in her ostracism as a child, and that she is partially possessed by a Shade. The player gains the ability to understand what the shades are saying, including the one possessing Kainé, though in-game Nier, Weiss, and Emil are still unable to. Additional cutscenes are also shown, giving the motivations and backstory behind the Shade bosses that are fought and showing them as sentient people trying to defend their friends against Nier. The ending to the second playthrough shows that Emil survives his sacrifice, and that Gestalt Nier and Yonah are reunited in the afterlife. A third or further playthrough presents the player with a choice in the ending to save Kainé, who is seen to be dying in agony; Nier can either kill her to end her suffering (the third ending), or sacrifice his life for her (the fourth ending). The latter choice not only erases all memory of him from the other characters' minds, shown in a final cutscene, but also deletes all of the player's saved progress, as if the game had never been played. Moreover, if the player wants to start a new game, they will be unable to enter the same name chosen for the previous playthrough for the Nier character. The events of Nier: Automata take place after this ending. The concept that would become Nier was first proposed following the release of Drakengard 2 and the reveal of seventh generation consoles. The original concept was for a third entry in the Drakengard series. It was intended to be for PlayStation 3 due to the lessening importance of the PlayStation 2, which Drakengard 2 had been made for. However, as the project evolved, the original ideas were reworked and the game eventually became a spin-off from the main series. Despite this, the game's director Yoko Taro continues to think of it as the third Drakengard game. Including concept planning, the total development time lasted three years, with two years spent actually developing the game. It was initially a small-scale project, but during planning it grew into a full-fledged role-playing game. Development was handled by Cavia with help from Square Enix, who had previously provided development support for the Drakengard games. Square Enix had minimal input on Yoko's vision for the game's atmosphere and story, allowing him high creative control. Nier is intended to be set over 1000 years after the events of Drakengard's fifth ending. In this scenario, the game's protagonists Caim and Angelus travel across a dimensional boundary to fight a monstrous beast. After winning the battle and killing the monster, they are shot down by a fighter jet and killed; their introduction of magic to the world leads to magical research that results in the Black Scrawl. According to Yoko, after the dark story of Drakengard, Yoko focused on more positive themes of friendship and combined effort. Much of the game was inspired by the September 11 attacks and the War on Terror. Yoko took from it the idea of a terrible event where both sides believed they were doing the right thing, and wanted to show the player multiple perspectives of the same events. The term "Replicant" was borrowed by Yoko from the 1982 science fiction movie Blade Runner, although Yoko did not cite a particular source for Nier's name, passing it off as a codename that persisted through development. The game's characters were designed by Kimihiko Fujisaka, who had previously worked on the main Drakengard series. Two character designs for the protagonist were created for Nier. The developers believed that the Japanese audience would respond more strongly to a younger protagonist, while non-Japanese audiences would prefer an adult Nier character. Other than changing Nier's appearance and modifying a few lines of dialogue to fit with Nier being a father rather than a brother to Yonah, the developers made no changes between the two versions; while it was initially believed that the older Nier was the character's original design, an interview with Yoko clarified that the young Nier was the original vision. Many characters underwent changes during development, and some needed to be cut: there were originally thirteen Grimoires, with all but three being cut: those that remained were Weiss, Noir and Rubrum. Emil's character was derived from a female character named Halua, while Kainé was originally a far more feminine type who hid her violent nature. Yonah's original Japanese name was derived from the Biblical name Jonah: this could not be taken verbatim into its localized form due to the name being associated with a man, so the name was changed to "Yonah". Kainé's character was made intersexual, since the team felt it fit in with many other aspects of her gritty backstory. Kainé's status as an intersexual caused some commotion in western territories, which is something the team did not actively intend. Yoko attributed the original suggestion to female staff members working on the game. The combat and action elements of Nier were inspired by the God of War series of games, which both Taro and Saito enjoyed. While the games had not been as popular in Japan as in North America, the two felt that the idea of having boss fights with different combat styles than the regular battles was an idea that would appeal to players in both regions. The changing styles, as well as the occasional changes in camera angle and movement, were meant to "accentuate [the] gap between real, modern scenery and the fantasy world" as a tie-in to the game's story. The game was meant to appeal to older players; it was intended as an action-RPG for an older market than Square Enix's action-RPG series Kingdom Hearts. This influenced the decision to have a main character in his 30s, as well as more blood and swearing than typical in a Square Enix RPG. The fusion of different gameplay styles was included as a homage to earlier gameplay styles and genres. Nier was originally intended to be exclusive to the Xbox 360, but after deciding to also develop the game for PlayStation 3, the developers decided to further divide the Japanese release of the game. Nier Gestalt would be released for the Xbox 360, featuring the adult Nier (as in the international release for both platforms), while Nier Replicant, for the PlayStation 3, would feature the young Nier. The localizations for the game—in English, French, and German—were produced during development so that all of the versions could be released at the same time, and so that Cavia and Square Enix could solicit feedback from North America and Europe on the game so that it would appeal to players outside Japan. Nier was officially unveiled in June 2009 at the Electronic Entertainment Expo 2009 for both the PlayStation 3 and Xbox 360, to be developed by Cavia and published by Square Enix. It was directed by Yoko and produced by Takuya Iwasaki of Cavia and Yosuke Saito of Square Enix. Due to its high violence, the game was given a CERO D rating in Japan. The soundtrack to Nier was composed by a collaboration of the studio MoNACA, directed by Keiichi Okabe and including Kakeru Ishihama and Keigo Hoashi, and Takafumi Nishimura from Cavia. Okabe served as the lead composer and as the director for the project as a whole. Okabe was brought onto the project when the concept for the game was first being devised, and worked intermittently on the soundtrack for the next three years until its release. The music for the game was generally composed entirely separately from the development of the game. The music was designed for different motifs to appear in various arrangements throughout the soundtrack, and also to convey a sense of sadness even during the "thrilling" tracks. Okabe was allowed a great deal of freedom regarding what the music was to sound like; game director Yoko Taro's main request was that he use a lot of vocal works. The soundtrack to Nier is largely composed of melancholy acoustic pieces which heavily feature vocals by vocalist Emi Evans (Emiko Rebecca Evans), a singer from England living in Tokyo. She is the singer for the band freesscape, and had previously worked on video games such as Etrian Odyssey. In addition to singing, Evans was asked to write her own lyrics in futuristic languages. The composers gave her preliminary version of songs and the style they wished the language to be in, such as Gaelic or French, and she invented the words. Evans wrote songs in versions of Gaelic, Portuguese, Spanish, Italian, French, English and Japanese, where she tried to imagine what they would sound like after 1000 years of drifting. Square Enix released a soundtrack album of music from the game, titled Nier Gestalt & Replicant Original Soundtrack, on April 21, 2010. The soundtrack album reached number 24 on the Japanese Oricon music charts, and remained on the charts for 11 weeks. As preorder bonuses for Nier Gestalt and Nier Replicant, two mini-albums, Nier Gestalt Mini Album and Nier Replicant Mini Album, were included. An album of arranged music, NieR Gestalt & Replicant 15 Nightmares & Arrange Tracks, was published by Square Enix on December 8, 2010. The arranged album reached number 59 on the Oricon music charts, a position it held for a week. Another album, NieR Tribute Album -echo-, was released on September 14, 2011, and an album of piano arrangements, Piano Collections Nier Gestalt & Replicant, was published on March 21, 2012. In Japan, Nier Gestalt sold over 12,500 copies in Japan the week of its release, while Replicant sold over 60,000 and was the top-selling video game in Japan that week. Replicant sold over 121,000 copies in Japan by the end of May 2010, and ended the year with over 134,000 copies sold. As of 2018, The two versions of Nier sold about 700,000 copies worldwide. Nier received mixed reviews. Reviewers criticized the graphics, with Ryan Clements of IGN saying that "one of Nier's greatest flaws is its visuals," while GameSpot's Kevin VanOrd bemoaned the "flavorless visuals" and "lifeless environments". Dustin Quillen of 1UP.com said that the game "looks downright primitive", while Adriaan den Ouden of RPGamer, who awarded the game a higher score than most, said that "the environments are bland and poorly rendered". The music and voice acting, however, were praised; Clements said that "both are quite excellent", den Ouden called the soundtrack "absolutely fantastic", Chris Schilling of Eurogamer said that the music was full of "memorable themes", and one of the four reviewers for the Japanese Weekly Famitsu termed it "a cut above". Reviewers were divided in their opinion on the effectiveness of the multiple styles of gameplay presented. Seth Schiesel of The New York Times said that while "there are plenty of games that surpass it in each area," that Nier pulled all of the styles together into a "coherent, compelling whole" instead of feeling "disjointed"; he especially praised a section of the game that is presented entirely through text. Patrick Kolan of IGN Australia, however, said that while the different styles were "interesting" and one of the game's biggest strengths, they suffered from poor execution and cohesion and left the game "with split-personality disorder". Clements said that "the developers' ideas sometimes outshine the actual implementation", while highlighting the gameplay elements as part of what made the game fun. Adriaan den Ouden called out the variety as the best part of the game, likening it to a buffet table, while also acknowledging that none of the sections were "amazing" on their own and could easily be looked upon poorly. The regular combat was reviewed as solid, if not exceptional, and the sidequests were seen as repetitive, with Quillen saying that "the side quests in Nier are about as numerous as they are totally mindless," VanOrd calling them "a series of monotonous events, often connected only by long stretches of nothing," and a Famitsu reviewer saying that they "didn't see much purpose" to them. Clements said that the combat had "a fair amount of satisfaction", though players should "not expect anything too extraordinary", and Kolan termed the combat as "moderately deep". Critics gave a generally positive review to the plot and characters; VanOrd liked most of the characters but thought Nier was bland and the story "soggy", while Schiesel called the story "provocative" and "profound", saying that it "succeeds at fostering an emotional investment in its characters and in its world". Quillen said that the plot "takes some fascinating and truly original turns" and that Nier has "a supporting cast of genuinely interesting folks," and Schilling said that the story made the game "difficult to dislike". The Famitsu reviewer that viewed the game the most favorably said that he was "blown away" by the multiple endings, and that "nothing like it's been done in gaming". In 2015, Jeffrey Matulef of Eurogamer characterized Nier as "the rare game that gets better with age". Despite "poor sales and tepid reviews", he wrote, the game had acquired a cult following, which he attributed to its "sense of wonder" due to its cryptic storytelling, mashup assortment of game mechanics and melancholy mood. On May 11, 2010, Square Enix released a piece of downloadable content for the game, titled "The World of Recycled Vessel". The small expansion features a series of fifteen battles with the incarnation of Nier other than the one in the specific version of the game. Nier enters the battles in a dream world accessed through a diary in his house. The expansion offers new costumes and weapons for the game. Square Enix executive producer Yosuke Saito later commented that "a number of things" related to Nier were in progress, and that an announcement could be due in 2011. The only announcement ended up not being for a new Nier video game, but instead for a live evening concert for Nier's music titled "Nier Night ~ Evening of Madness" which took place on October 28, 2011. Nier was the last game that Cavia made; the company was absorbed into its parent company, AQ Interactive, in July 2010. In March 2011, there were plans made between Yoko and Takuya Iwasaki, one of the original producers for Drakengard, to develop a port of Nier for the PlayStation Vita at Iwasaki's company Orca. The port would have incorporated material from both versions of the game. When Orca was chosen to help develop Dragon Quest X, the project was shelved. A number of key staff from Nier's development, including director Yoko and Okabe, would later reunite to work on a new entry (Drakengard 3) in the Drakengard series from which Nier was spun off. A sequel titled Nier: Automata, developed by Square Enix and PlatinumGames for the PlayStation 4, was released in Japan on February 23, in North America on March 7 and worldwide on March 10, 2017. The PC version of Nier: Automata was released on March 17, 2017. Yoko, Saito and Okabe returned to their previous roles. Other staff members include producer Atsushi Inaba and artist Akihiko Yoshida. ^ Japanese: ニーア ゲシュタルト, Hepburn: Nīa Geshutaruto? ^ Japanese: ニーア レプリカント, Hepburn: Nīa Repurikanto? ^ "豪華布陣で挑む『NieR New Project（仮題）』スタッフインタビュー詳細版". Famitsu. 2015-07-02. Archived from the original on 2015-07-02. Retrieved 2015-07-02. ^ a b c d e Schilling, Chris (2010-04-22). "Nier Review". Eurogamer. Archived from the original on 2011-07-12. Retrieved 2011-07-12. ^ a b c d e f g Dustin, Quillen (2010-05-06). "Nier Review". 1UP.com. Archived from the original on 2011-07-12. Retrieved 2011-07-12. ^ a b c d e VanOrd, Kevin (2010-05-03). "Nier Review". GameSpot. Archived from the original on 2011-07-12. Retrieved 2011-07-12. ^ a b c d e den Ouden, Adriaan. "Nier – Staff Review". RPGamer. Archived from the original on 2011-07-12. Retrieved 2011-07-12. ^ a b c Meyer, John Mix (2010-03-03). "Q&A: Square Enix's Nier Combines Fighting, Farming". Wired. Archived from the original on 2010-04-25. Retrieved 2011-07-12. ^ Cavia (April 27, 2010). Nier. PlayStation 3. Square Enix. Grimoire Weiss: ...I...remember... Devola... Popola... You are not human. In fact...oh, no. [...] / Popola: All of us—every person in this room—are mere shells created by the true humans. / Nier: You lie! / Devola: Nope. Not this time. You're not human. None of us are. / Emil: So the humans—I mean, the true humans... They're extinct? / Grimoire Weiss: [voice shaking] No, they still live on. You know them as Shades. Each Shade is a twisted remnant of what was once a human being. ^ Cavia (April 27, 2010). Nier. PlayStation 3. Square Enix. Yonah: [while possessed; to the Shadowlord] Dad, please stop. I…I don't want this anymore. I don't need someone else's body. I don't want it. ^ Sato (2013-04-05). "Drakengard 3 Producer And Creative Director Explain How The Game Came To Be". Siliconera. Retrieved 2013-09-10. ^ a b カイネの誕生は「男性のヒロインを入れて☆」と言う要望から　『ニーア レプリカント・ゲシュタルト』の横尾ディレクターにインタビュー！（前編） (in Japanese). GetNews. 2010-05-19. Archived from the original on 2015-07-20. Retrieved 2015-03-11. ^ a b c d e 【DEVELOPER'S TALK】『ドラッグ オン ドラグーン』のスタッフが再集結！PS3とXbox360で異なる主人公を描いた『ニーア レプリカント／ニーア ゲシュタルト』に迫る (in Japanese). Inside Games. 2010-05-18. Archived from the original on 2015-03-11. Retrieved 2015-03-11. ^ "『NieR Replicant（ニーア レプリカント）』／『NieR Gestalt（ニーア ゲシュタルト）』戦いの地は......東京!?". Famitsu. 2010-04-16. Retrieved 2014-03-16. ^ Ward, Robert (2014-03-20). "NieR and Drakengard Creator Says NieR Was Inspired By 9-11". Siliconera. Retrieved 2014-03-20. ^ a b c 妹ヨナの日記は女性社員が書いた！　「グラマーになりたい！」　『ニーア レプリカント・ゲシュタルト』の横尾ディレクターにインタビュー！（後編） (in Japanese). GetNews. 2010-05-21. Archived from the original on 2016-03-04. Retrieved 2015-03-11. ^ 『ドラッグ オン ドラグーン3』キャラデザ担当の藤坂公彦氏と柴貴正Pのロングインタビューをお届け. Famitsu. 2013-09-02. Archived from the original on 2016-03-04. Retrieved 2013-12-12. ^ a b c d "『ドラッグ オン ドラグーン』のスタッフが再集結！PS3とXbox360で異なる主人公を描いた『ニーア レプリカント／ニーア ゲシュタルト』に迫る" (in Japanese). Inside Games. 2010-05-18. Archived from the original on 2011-07-12. Retrieved 2011-07-12. ^ Spencer (2010-05-20). "Barbarian Nier Was Born In Los Angeles". Siliconera. Retrieved 2012-03-15. ^ ニーア ザ・コンプリートガイド+設定資料集 [Grimoire Nier: The Complete Guide + Cels] (in Japanese). ASCII Media Works. 2010-05-28. pp. 160–163. ISBN 978-4048686716. ^ Yip, Spencer (2010-03-31). "Our Nier Interview Goes Beyond The Black Scrawl". Siliconera. Archived from the original on 2014-11-08. Retrieved 2014-03-25. ^ Yin-Poole, Wesley (2010-03-17). "NIER Preview". Video Gamer. Archived from the original on 2011-07-12. Retrieved 2011-07-12. ^ Saito, Yosuke (2010-03-17). "Nier Yosuke Saito Interview (Xbox 360)". GameSpot. Archived from the original on 2011-07-12. Retrieved 2011-07-12. ^ Brudvig, Erik (2009-05-29). "Pre-E3 2009: Square Announces Nier". IGN. Archived from the original on 2011-07-18. Retrieved 2011-07-18. ^ Ng, Keane (2009-05-29). "Square-Enix Announces New Front Mission, Nier". The Escapist. Archived from the original on 2009-06-08. Retrieved 2009-06-03. ^ "NieR (2010) Xbox 360 credits". MobyGames. Retrieved 2017-04-19. ^ Napolitano, Jayson (2010-05-04). "Deep into NieR: Interview With Vocalist and Lyricist Emi Evans". Original Sound Version. Archived from the original on 2011-07-12. Retrieved 2011-07-09. ^ Gann, Patrick (2010-04-27). "NieR Gestalt & Replicant OST". RPGFan. Archived from the original on 2011-07-12. Retrieved 2011-07-09. ^ ゲーム・ミュージック (in Japanese). Oricon. Archived from the original on 2011-07-12. Retrieved 2011-07-09. ^ Kotowski, Don. "Nier Gestalt Mini Album :: Review by Don". Square Enix Music Online. Archived from the original on 2011-07-12. Retrieved 2011-07-09. ^ Kotowski, Don. "Nier Replicant Mini Album :: Review by Don". Square Enix Music Online. Archived from the original on 2011-07-12. Retrieved 2011-07-09. ^ Gann, Patrick (2010-12-25). "NieR Gestalt & Replicant 15 Nightmares & Arrange Tracks". RPGFan. Archived from the original on 2011-07-12. Retrieved 2011-07-09. ^ ニーア　ゲシュタルト　＆　レプリカント／１５　Ｎｉｇｈｔｍａｒｅｓ　＆　Ａｒｒａｎｇｅ　Ｔｒａｃｋｓ (in Japanese). Oricon. Archived from the original on 2011-07-12. Retrieved 2011-07-09. ^ ニーア トリュビュートアルバム　発売決定 (in Japanese). Square Enix. Archived from the original on 2011-07-12. Retrieved 2011-07-09. ^ Napolitano, Jayson (2012-03-19). "NieR and Dear to Our Hearts: Piano Collections NieR (Review)". Original Sound Version. Archived from the original on 2012-03-19. Retrieved 2012-03-19. ^ "Nier for PlayStation 3". Metacritic. Archived from the original on 2011-07-12. Retrieved 2011-07-12. ^ "Nier for Xbox 360". Metacritic. Archived from the original on 2011-07-12. Retrieved 2011-07-12. ^ a b c d Gifford, Kevin (2010-04-14). "Japan Review Check: Nier, Knights in the Nightmare PSP". 1UP.com. Archived from the original on 2011-07-12. Retrieved 2011-07-13. ^ a b c d e Clements, Ryan (2010-05-11). "Nier Review". IGN. Archived from the original on 2011-07-12. Retrieved 2011-07-12. ^ a b c Kolan, Patrick (2010-04-21). "Nier AU Review". IGN. Archived from the original on 2011-07-12. Retrieved 2011-07-12. ^ "【ゲームソフト販売本数ランキング TOP30】集計期間：2010年4月19日～4月25日" (in Japanese). Famitsu. 2010-05-10. Archived from the original on 2011-07-12. Retrieved 2011-07-12. ^ Graft, Kris (2010-04-30). "Cavia and Square Enix's Nier Replicant Leads Japan Charts". Gamasutra. Archived from the original on 2010-11-10. Retrieved 2011-07-01. ^ "【ゲームソフト販売本数ランキング TOP30】集計期間：2010年5月24日～5月30日" (in Japanese). Famitsu. 2010-06-10. Archived from the original on 2011-07-12. Retrieved 2011-07-12. ^ "2010 Top 100 Console Software in Japan". The Magic Box. Archived from the original on 2014-08-12. Retrieved 2015-02-04. ^ a b Schiesel, Seth (2010-05-04). "Wielding Swords in a World of Sharp Tongues". The New York Times. Archived from the original on 2011-07-12. Retrieved 2011-07-12. ^ Matulek, Jeffrey (2015-06-28). "Nier is the rare game that gets better with age". Eurogamer. Retrieved 2015-06-28. ^ Reparaz, Mikel (2010-05-10). "Make Nier even weirder with World of Recycled Vessel DLC". GamesRadar. Archived from the original on 2011-07-20. Retrieved 2011-07-20. ^ Masashi, Oji (2010-12-28). "総勢60名以上のゲームクリエイター＆声優/4Gamer執筆陣に聞いてみた「2010年の注目タイトル」と「2011年への意気込み/期待」" (in Japanese). 4Gamer. Archived from the original on 2011-07-12. Retrieved 2011-07-13. ^ Spencer, Spencer (2011-09-29). "Nier Developer Cavia is No More". Siliconera. Archived from the original on 2013-01-23. Retrieved 2013-01-23. ^ Quillen, Dustin (2010-07-13). "Nier Developer Cavia is No More". 1UP.com. Archived from the original on 2011-07-12. Retrieved 2011-07-13. ^ 豪華布陣で挑む『NieR New Project（仮題）』スタッフインタビュー詳細版 (in Japanese). Famitsu. 2015-07-02. Archived from the original on 2015-07-08. Retrieved 2015-07-08. ^ Phillips, Tom (2013-03-14). "Deadly Premonition developer making Drakengard 3". Eurogamer. Archived from the original on 2014-10-17. Retrieved 2013-10-09. ^ McWhertor, Michael (2015-06-16). "Square Enix is making a new Nier with Platinum Games". Polygon. Archived from the original on 2015-06-16. Retrieved 2015-06-16. ^ Seto, Dan (2015-10-29). "The Full Story Behind Nier: Automata on PS4". PlayStation Blog. Archived from the original on 2015-10-29. Retrieved 2015-10-29.